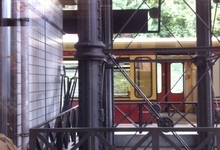 Shot on Berlin’s S-Bahn, SCHNELL! is part of a series of works that explore the limits of digital capture by setting up formal parameters and then letting them play themselves out automatically in relation to randomizing elements. The capture rate is set at one frame per second; sound is recorded in real time. Focus, exposure, and effective shutter speed float and respond eccentrically to changing light conditions in ways that produce a free play between figuration and abstraction.